Come Valentines Day, many guys find themselves in a quandary. If you have a wife or girlfriend, there is an expectation of dinner in a nice restaurant, or some other special treat that reflects your fealty and affection. This may call for considerable advanced planning. Restaurants fill up their reservations weeks in advance. You might suggest cooking a fine repast for your honey instead, but chances are if you have that talent you’re already doing it on a semi-regular basis – what then would make Valentines Day special? This year, when that couple-week-in-advance planning came around and a discussion of potential restaurants that still had reasonable reservation hours ensued, our excitement and anticipation reached a not so rousing level of “meh”. It was time to consider alternatives. My wife came up with the idea. A trip to the coast! We do have a rather nice one, and the thought of a slightly longer trip with an overnight stay at some lovely venue punched all the romantic buttons. We picked our town, and a bit of research on Air B&B sites revealed a promising location. The only caveat: at least two nights stay were required. Darn. Don’t ya just hate it when life forces you to do what you should be doing in the first place? Double the pleasure, two nights it was. And the destination? The Sea of Lincoln. Or maybe it was the C of Lincoln. Wait. I got it, it was Lincoln City, with an ocean on its doorstep. 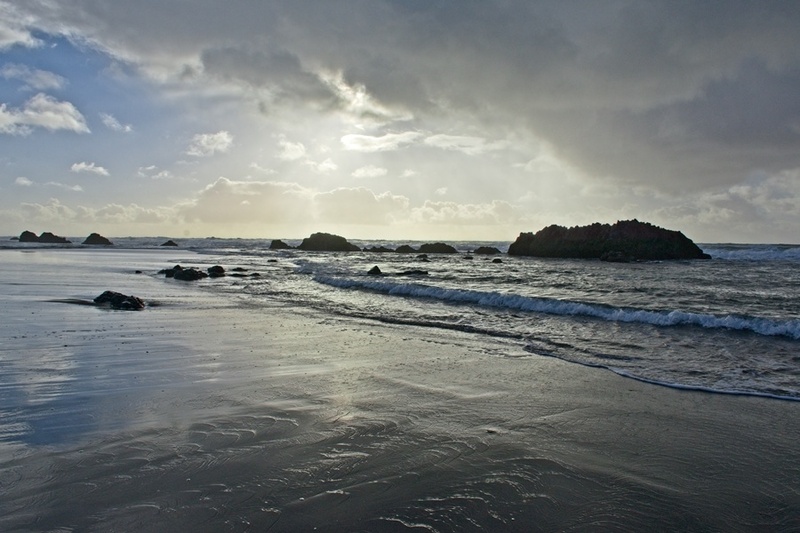 Lincoln City is on the north-central Oregon coast. Long and skinny, it follows the coastline for 6-7 miles, with open beach nearly the entire span. 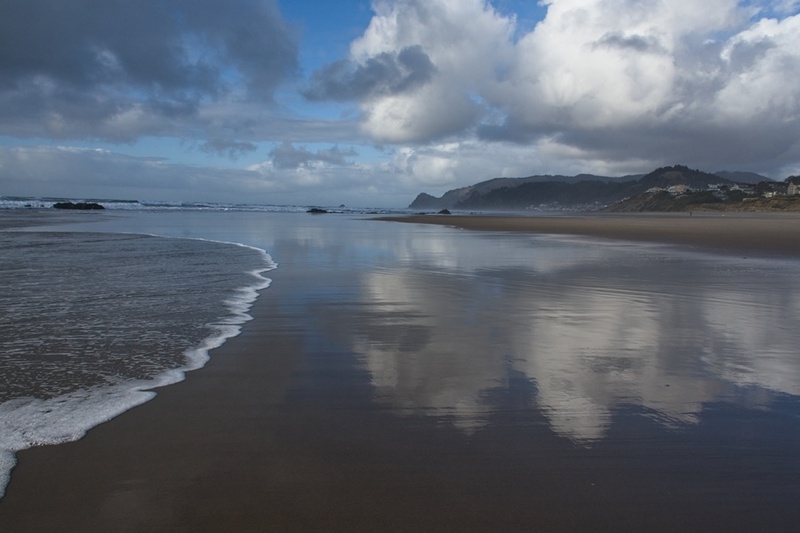 Oregon law mandates the ocean beaches are public, private development cannot close off sections. If you were so minded you could walk the entire span, until you ran into the cliffs of headlands. We opted to do our strolling in two sections, one on the north end near “Roads End” and one on the south end near Siletz Bay. February weather on an Oregon beach is not an occasion for a bikini or speedo. While not frigid, that first afternoon the breeze was enough to wear a coat, zipped firmly. Even the seagulls respected the rule, all wore a coat of feathers, none wore a bikini. There were a few hotshots speeding around, practicing levitation and racing their reflections. But the cool temperatures prevailed, it was a dead heat. An ocean view that’s strictly water and sand is monotonous. I’m always partial to a foreground subject, something for the waves to meet up with to rock-and-roll. There’s something about walking along the surf line. Perhaps it’s that white noise roar, cranked up by nature’s amplifier. Maybe it’s the game of tag, as the waves try to sneak in to soak your feet when you’re ogling a bird or a rock, making you jump and run. It could be all that fresh air and open space, freeing your mind from the claustrophobia of the city. Whatever it is, I like it. And as you wander down the beach, the winter sun looking brightly down on the waves and glassy beach from its southern vantage point, it pays from time to time to look to the north. The glare is gone. Colors, once overcome by the strength of the sun’s stare reemerge. Our return hike, back up the coast featured the more subtle earth tones native to the Pacific Northwest. Having absorbed enough wind for one hike, we returned to our lodgings for a break. Later, I tried to make something of the sunset. 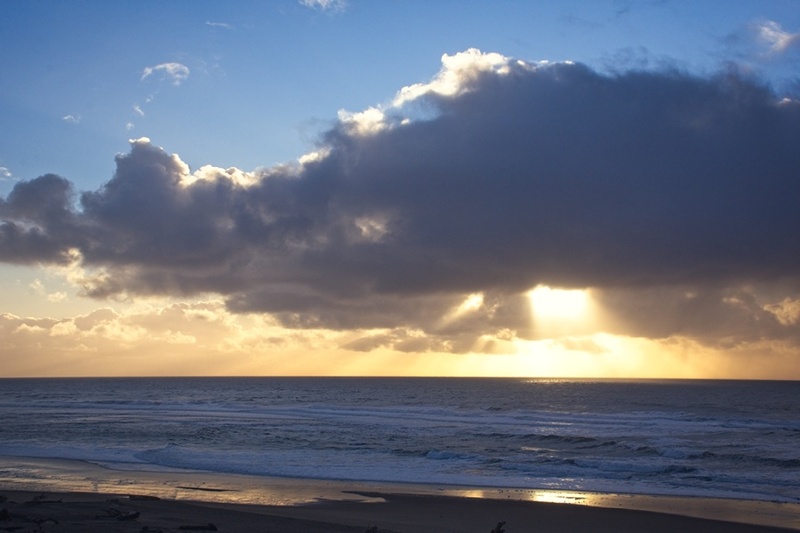 Much of Lincoln City, including our digs sits atop cliffs overlooking the beach. We had good access via stairs and I got a sunburst halfway down. But that was it. By the time I got to the beach and found a section with foreground structure, the sun had fallen behind a bank of clouds that foreshadowed the weather to come. Any hint of dramatic color was but a dream. 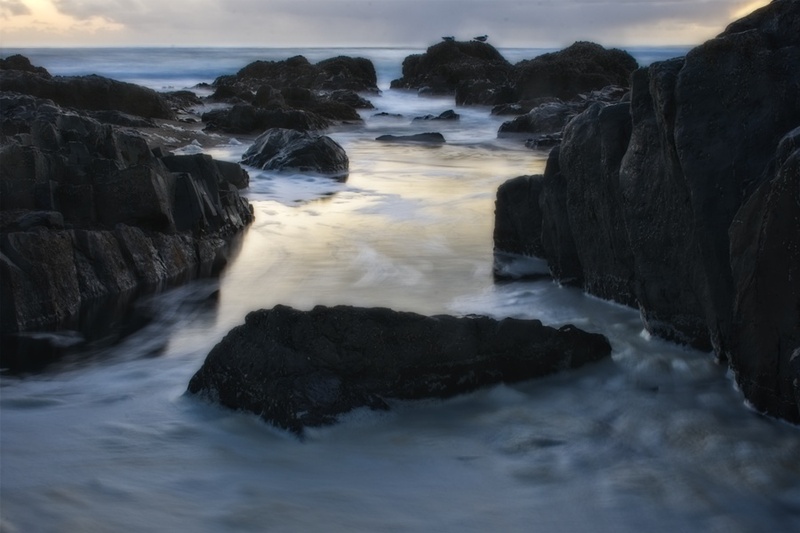 Even if the sky was ho-hum, the rocks and evening surf played a misty tune. Rejoining my bride, we picked a restaurant somewhat at random and enjoyed a nice Valentines meal. And we didn’t even need a reservation. The following day we stuck to the south end. 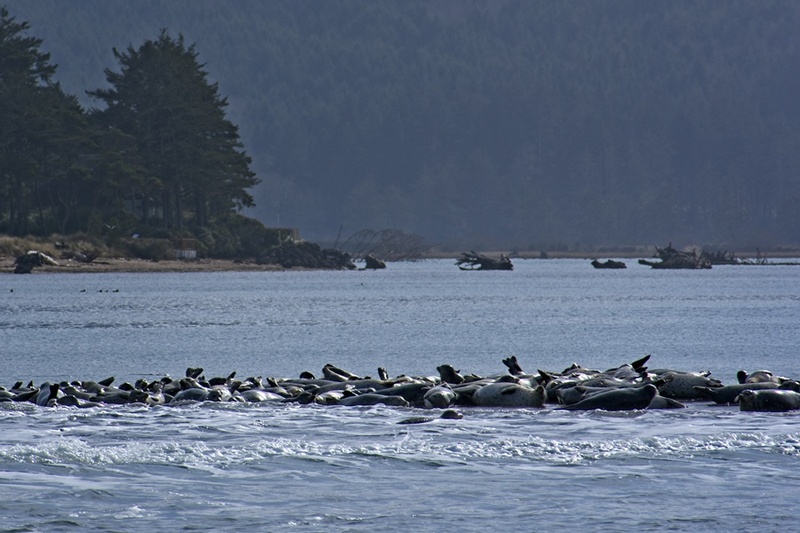 Hiking down to the spit at the entrance of Siletz Bay, we found a haul out for a gang of seals. Seals weren’t the only critters congregating. A driftwood log showed evidence of a long swim – a colony of acorn barnacles gave it a serious case of ocean acne. 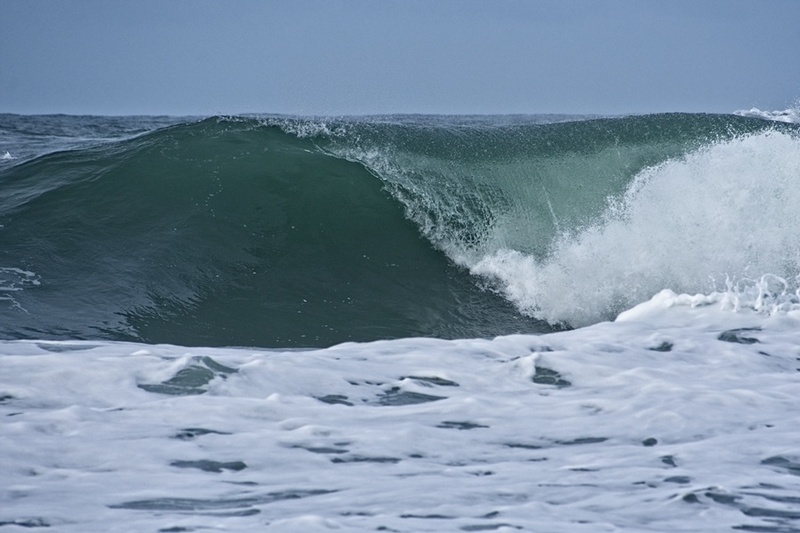 And with the surf like this, why wouldn’t a log go surfing? Doesn’t this just make you want to make you go out there, surfboard in hand, to ride the waves? Surf like that would chew me up and spit me out like low rent bubble gum. That water isn’t tropical either. It’s maybe upper 40’s F (7-8 C). The rest of our time by the Sea of Lincoln was unremarkable – standard tourist stuff. Visiting glass shops, and a museum. Being served dinner by a fellow from Nepal. Watching Olympics. But even with the standard tourist fare, the trip was much more memorable than yet another Valentines dinner at yet another Portland restaurant. And isn’t that what counts? “…spit me out like low rent bubble gum” must be from a Sam Spade movie, great line! All the photos are excellent, as always, and actually kind of relieved none of the seagulls were in bikinis, that would just be weird – – but the “as long as we’re dreaming” shot is very cool, it would make a great poster. We East Coast types don’t hear as much about the Oregon coast as California’s, but this looks like my kind of vacation. Sounds like a great getaway in every way. The beach shots are gorgeous and I loved the variation, from placid to pounding water. “Placid to pounding water.” Well put. That kind of says it all about the magic of visiting the ocean. Great pics as always, Dave. I don’t know of the area at all, but your seascapes are marvellous. As a rider, we always go out for a meal a few days after Valentines Day, since most restaurants seem to hike up the prices for the special day! Thanks, Mick. The Oregon coast is target rich when it comes to pictures. That’s a good thought on going out – who says the calendar should dictate what you call a special date? Darn, I was hoping for a photo of a seagull in a bikini! Sounds like the perfect Valentine’s Day — your wife is a genius! I’ve heard that the worst day of the year (service and vibe wise) to go to a restaurant is Valentine’s Day. So, your wife’s solution was brilliant and it looks and sounds like it worked out wonderfully. Love the photos, as usual. Especially the barnacles. Makes me want to run my hand over that texture. I suspect that apart from the tips, the waitstaff probably dreads it. I never thought about feeling the texture of barnacles. I tend to think of what they look like underwater, when they pop little fans out for filter feeding. 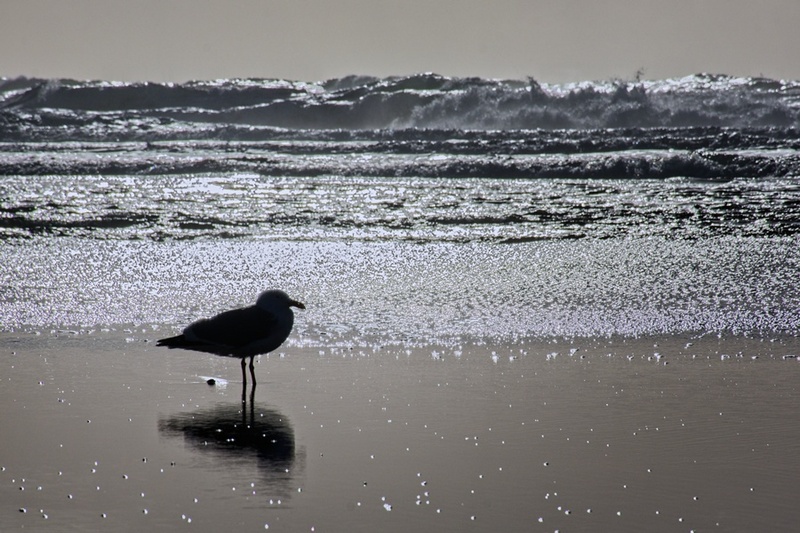 Fabulous pictures – I love that one with the Barnacles, and the waves too. And what a neat Valentine idea! Thanks, M.B. 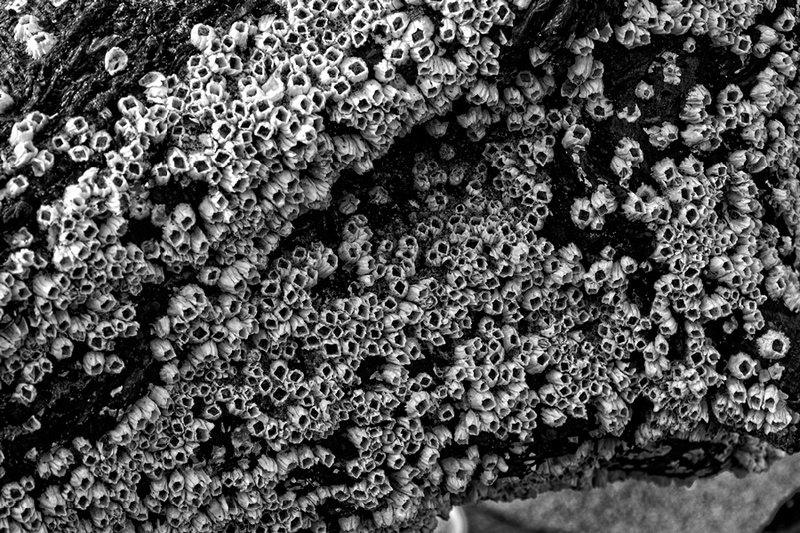 I converted the barnacle shot to black and white – I wonder how many folks even noticed? 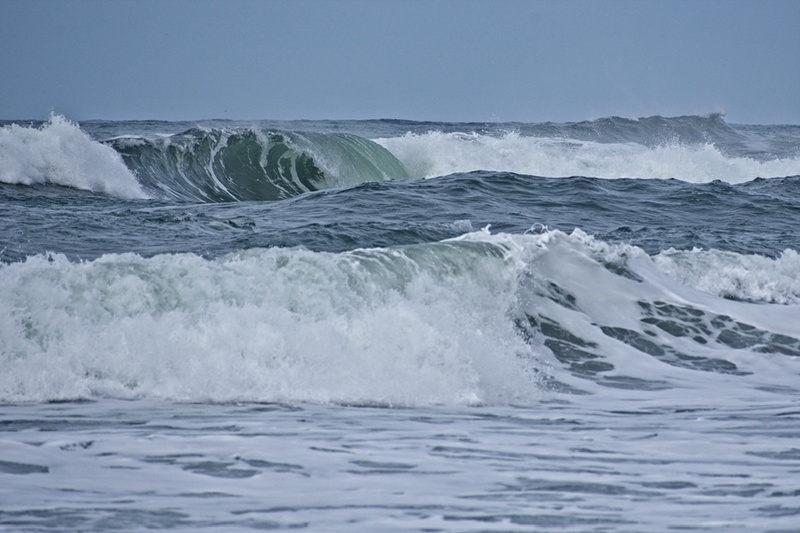 There’s something special about ocean surf. It’s almost primal, with the sea calling us back. So the log surfing the waves was wood, or our illustrious blogger? Liked the pics and the idea of a trip like this. Inspirational. If it wasn’t so chill, wet, and windy right now I’d go out for a coastal walk. And I’m glad to hear that Oregon keeps its coast clear, so to speak. The idea of anyone claiming a private stretch of beach makes me grumpy. What a great way to spend Valentine’s day! And I’m going to make my husband read your post, not for Valentine’s day (it’s too far from St. Louis for that), but because we really want to come to Oregon this July and find somewhere to stay near the coast. I’m sure it will be peak tourist season, but we’ll brave the crowds and try to find some beaches that aren’t quite so popular. Is Lincoln Sea one of the better known ones? Thanks’s Dave! That is really helpful, and I think that is the strategy we will use. I don’t mind if our hotel doesn’t have a beach view, as long as I can get to the beach. We want to explore as much as we can. Were you driving a Lincoln? Loved the humour and pictures! In fairness I’ve seen people going surfing in a sea like that, but I’ve always seriously wondered what kind of problems they have to go risking their necks like that. Answers on a postcard! No, but I did See a Lincoln. That has not been a hard and fast rule, but our Valentine’s gifts have been few. But we both would jump on this idea in a heart beat. Sound’s like a good heartbeat idea for Valentine’s #50! (Well done, BTW). It sounds really nice, Dave, I’m glad you two got away. 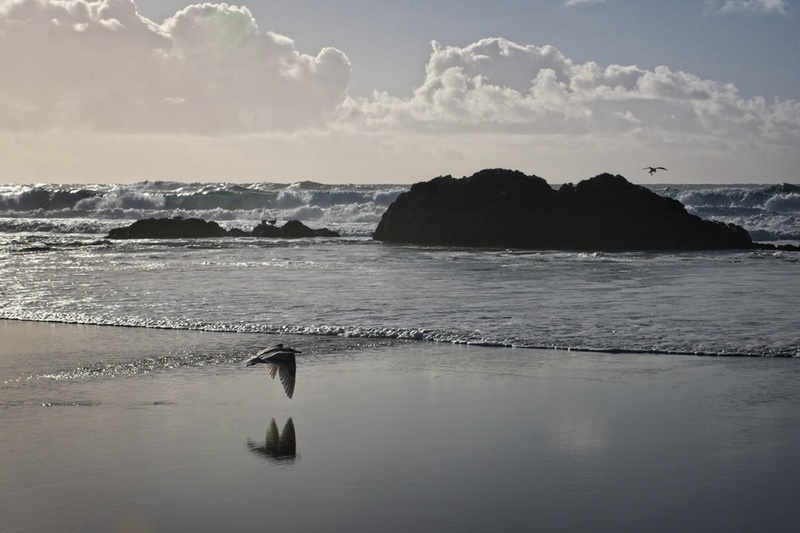 I loved the photos of the beach – the misty one especially – and the barnacles. And you humorous asides, yes, who can resist? Did I mention that I’m planning an Oregon – Cali trip? To Portland, maybe a little farther down 5, then to the coast, a few nights at an airbnb in Newport. Then on to meet Gunta in Gold Beach (sounds good right?). Then to California redwood country, and probably returning by a more inland route. Mid April. Have you done something similar? Sounds like a great trip. I’ve seen all that, but not on the same trip. Maybe we can meet up when you’re in Portland – see my About page for contact info. We’ll see if we can work that out – we won’t be stopping on the way down, but probably will on the way back. I’ll be in touch! I need a body of water named after me. “Hook’s Falls” sounds awesome, right? Sound’s much better than “Dave’s Swamp”, named due to the occasional eruption of swamp gas. You obviously chose the right times for your photos as the light in each is marvellous! Particularly liked the one with the flying birds, the nearest obligingly dipping over that pool. Your upbeat commentary has an airy feel too. Sounds like a great V-day! The photos as always are beautiful! When we went to Carmel by the Sea Vic asked me why I didn’t tell him to bring a swimsuit. My answer was, “You don’t want to jump in that water. Go dip your toes.” He didn’t know how cold the water is. He thought it would be as warm as our beaches in August. I remember you dive. Should have told him it’s wet suit water over there. What’s the water temp in summer? We know someone who belongs to the polar bear club up the Hudson River. Personally, the idea of swimming in the Hudson freaks us out. It’s cleaner than before but still polluted. If you ever come again I highly recommend the Inn at Spanish head. Great views from your room, and we love food and wine in the lounge on the top floor. We loved Lincoln City so much we moved here last month! We stayed about a block away from the Inn. They do have a nice view – the opening shot is from the rocks just in front. We like the coast in general, it’d be hard to pick one spot.